So, the Association has completed its first year, and looks good for its second! Keith is examining the possibility of setting up our own website, to which the Newsletter could be transferred, for access by a greater readership. Can it be that Giovanni is involved in all this, I ask myself. There was quite a brisk response to the IoM TT photo that appeared in the last Newsletter, not all of which agreed. However, the consensus of all inputs is that Rider No. 78 was Reg Lucas, of Mansfield, Notts., aboard AL7741 (he also owned AL7494, a slightly older machine). 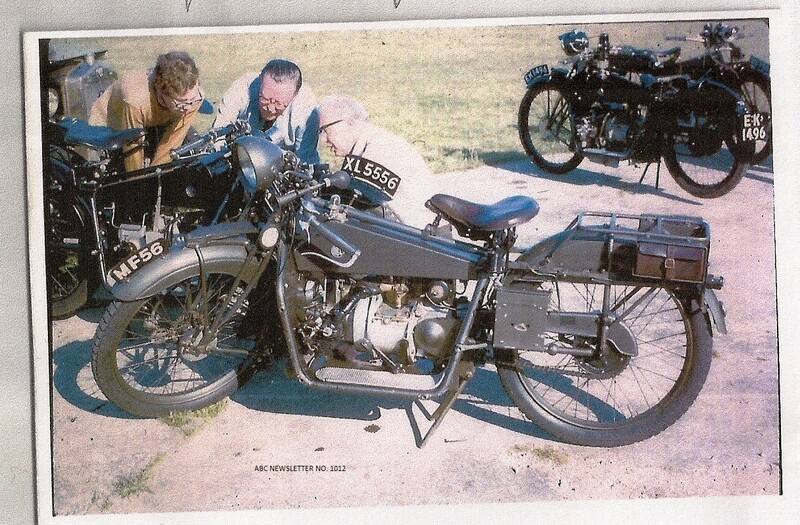 As reported in The Motor Cycle of 17.6.1920, his machine was modified for TT duties with an extra clutch cable to a foot pedal, and a "leg-control strap" to the lower part of the gear-lever: whoever said that foot-changing was new-fangled? Anyway, Reg's luck was good and bad: he overtook two earlier riders, but dropped a valve before the end of the first lap. Elsewhere in the TT line-up was E.S. 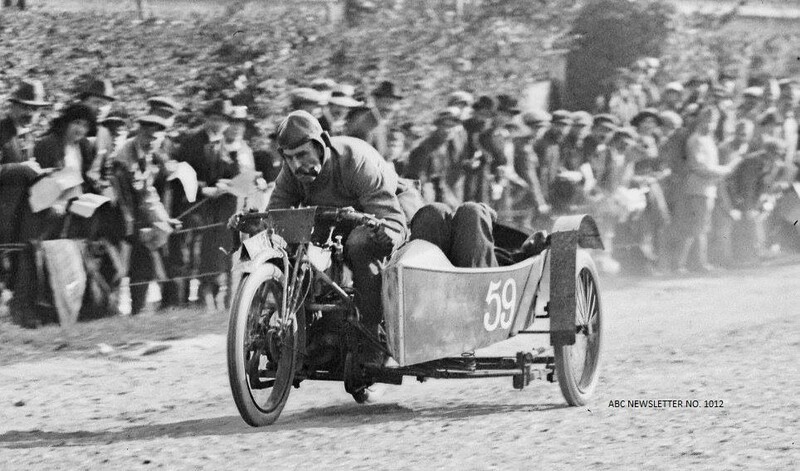 Abram of Stockport, on ABC DB1102: his luck lasted until lap 2… 1920 was evidently not a good TT year for ABC, the more so that it was seemingly their only one. I am told that our ABC pitch at Stanford Hall on 20.7.14 was smaller than usual, but was ably filled by three machines from Keith, and Richard's freshly-restored beauty. There was a fair degree of interest shown in these exhibits, resided over for some part of the day by Richard's other treasure, Monique. 'Fraid I wasn't there in person, my play was near-drowned by the torrential rain that fell the previous day in Gloucester. The Beaulieu extravaganza approaches…Steve Hall will be there, this year with a double-pitch, which means that his old pitch number of Y 401 may change. Anyway, I suggest that any members present on either day (6/7.9.14) meet up at Steve's stall at, say, 2 p.m., to exchange intelligence on any ABC wares on site! I'm informed that Howard and Lorna will be there again, and so shall I. Please let me know if you'll be there, and I'll forward Steve's pitch location to you as soon as it's known. The first photo in this month's gallery, from Howard, is a real corker. Place and date unknown, but Howard thinks that the machine is a G&R ABC, not Sopwith. The contents of the sidecar could have been borrowed from a Keystone Cops sequence… The wheel rims aren't original, and neither is the front mudguard, and there seems to be an extra oil pump on the tank. But so what? As a real piece of ABC smokin' action, it's classic! Welcome to a new Member from Oz: Andrew has become the happy owner of a very unmolested Sopwith, that has made something of a world tour to his address. In 1970-odd it was in Surrey, but progressed via Verrall's in Sussex (1998), Yesterdays in Holland (2003) and Bonhams in California (2007) to Melbourne. It has no kickstarter mechanism: Andrew is keen to source a set, or detailed drawings thereof. He operates an engineering business, and could perhaps be persuaded to go into batch-production on our behalf. Maybe. As mentioned some months ago, Giovanni was to produce some clutch levers (the one that goes on the outside of the gearbox) and valve-lifter levers ( that go on the sides of the crankcase). This has now happened. He has a few left, and they are for sale: the clutch levers will cost £36 each, and the valve-lifters will go for £25 per pair. They are effectively unfinished castings, of bronze, and Giovanni warns that the clutch levers are slightly shorter than original, not that this should be a problem. I'm sure there are plenty of clues for the eagle-eyed amongst us, to nail where this photo was taken. This one is believed to be from a David Hales Shuttleworth Rally, in the early seventies. XL is owned by an Association Member and MF is in a French museum. Is there any intelligence on EK? The sprog at top left is the previous owner of my machine! Any comments on the LH footbrake pedal on MF? 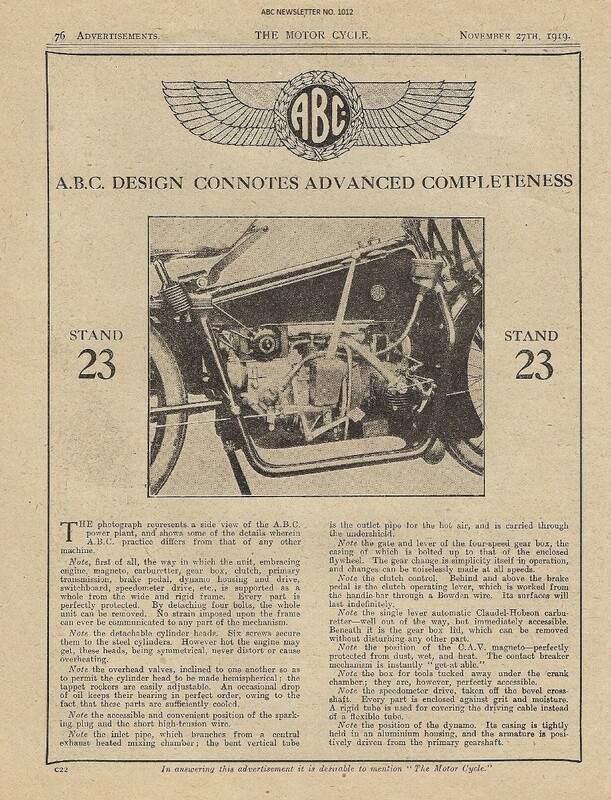 This advertisement, appearing in The Motor Cycle at about the time of the Olympia Exhibition of 1919, ties in quite neatly with the photo in Newsletter No. 1010, of the group of vans outside the Canbury Park Road works in Kingston: both highlight Stand 23 at the Show! (Thanks to David Hales for identifying the location of the convoy). On a different note, has anyone ever come across a toolbox-under-the-crankcase, as referred to in the blurb, on a Sopwith? I thought that this was an exclusive feature of the Gnome et Rhone, as illustrated by many photos of these machines.